A two drawer divan base for use with any mattress. A cream coloured two drawer divan base - ideal budget solution for children, rental accommodation etc. 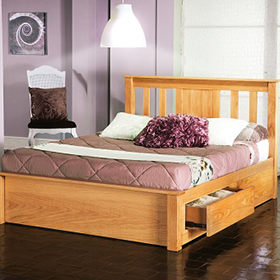 This divan base can be used with any mattress. This two drawer divan base is available in 3', 4', 4'6",5' or 6' sizes - please select your size option from menu. This divan base is also available in a four drawer version in 4',4'6",5' or 6' sizes.